Platform your own path to victory. To know about Octahedron, is to know about dev team behind it. Only, when I say team I actually mean person since Demimonde is a one-man studio and what Marco (also known as Monomirror) has been able to pull off with Octahedron, is absolutely phenomenal. Being a sound designer and musician “by trade”, everything you see in Octahedron such as its programming, design and soundtrack, is all done by Marco and when this gift of an indie game first released in 2018, it was meet with a lot deserved praise and now that it is on Switch, the praise is still coming. Across the game’s 50 handcrafted levels, divided by various worlds, players are first tasked with learning when to create a platform, so they can ascend upwards and engage in a healthy dose of platforming action, but it’s long before hazards and enemies are introduced. Yes, there comes a point where you can create platforms that fire a blast capable of killing certain enemies and destroying cracked surfaces, but it can be a hindrance at times. In all seriousness though, the platforming action offered by Octahedron: Transfixed Edition, is highly enjoyable and engaging. There are points where some mistakes can cost you everything, forcing you to restart a given level from scratch, due to losing all of your lives, but Octahedron is delightfully engaging and its atmospheric soundtrack is something of a dream. A dream which is in tune with the game, as level elements and enemies will actually follow the beat of the music. One of my favourite features however in the game however, is the fact the player can essentially become the Silver Surfer if they wish, due to the fact that while Y can be used to make a platform, holding the button and pushing the analog stick to one side, will cause your character to ride it like a vertical sliding surfboard. You can’t “Hang 10” for too long though, as platforms will vanish. So, if you want to avoid falling to your doom, you should either jump up onto the next platform or make sure you can create another one beneath you and get to safety. Where this neon 2D treasure comes into its own though, is in the facts that the controls are intuitive, everything is at 60 FPS and most importantly, from levels to game mechanics, everything is actually designed so that players can “discover and explore” on their own terms. Although, just in case Octahedron: Transfixed Edition has yet to sound like a game you can get behind, advancing on to the next world requires players to collect a certain amount of orbs, which can be created by destroying lightbulbs with your platforms and collecting them from the flowers that are then formed and by killing certain enemies. There are also tetrahedrons that can be collected as well. These don’t count towards unlocking the next area, but they are a necessity for earning medals. Players will also need to collect a certain amount of orbs for another kind of medal, and even clearing any level within a certain time limit will net you it’s time trials medal for it and there are even achievements that can be unlocked for doing all sorts of things, such as getting all medals, discovering a shortcut and more. Essentially, the game doesn’t end just because you managed to beat the levels and make it to the end, for there is always more to do and even if there wasn’t, Octahedron: Transfixed Edition has a ton of replay value and the overall experience is enjoyable regardless of playing the game in tabletop or TV mode. Although, with the exception, you can see all the action far bigger and have the volume as loud as you want it! Quite simply, if platformers are a genre you can’t get enough of and you’re looking for the next Celeste, Octahedron: Transfixed Edition could be the game you’re looking for. Demimonde worked hard to make this a game that shines and it absolutely does. 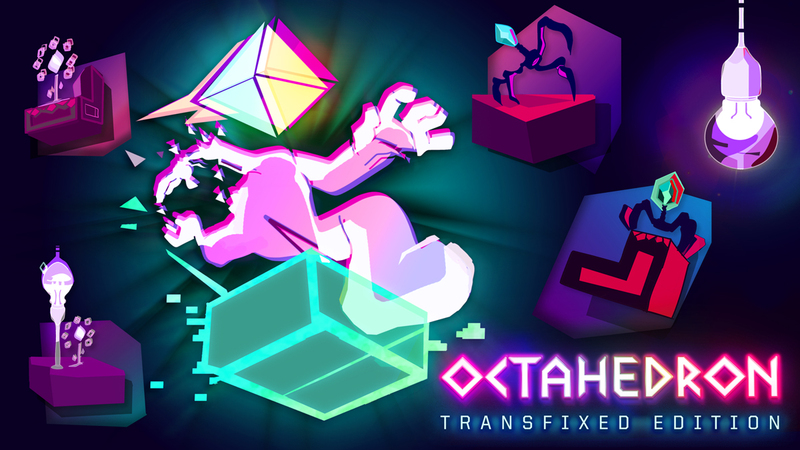 Sure, it can be a bit tricky at times, but with visuals that are a delight and an EDM soundtrack that gets the job done, Octahedron: Transfixed Edition is another indie developed platformer that deserves your time and attention.